Graph: Special subject "Project Management"
A list of completed and ongoing diploma thesis and dissertations/PhD theses can be found here. Research programme "Sustainable Development & Project Management (SD&PM)"
"Happy Projects!" is not a promise, but rather a wish from Roland Gareis to all those thinking and acting in projects. Though the chance to exerience "Happy Projects!" increases dramatically when applying the models and methods described in the present book. Process orientation and project orientation are new organisational strategies of companies. By the integration of structures and methodes of the process and project management essential synergies can be created. "Happy Projects!" 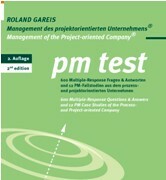 has been published in the 3rd edition and is based on ROLAND GAREIS Project and Programme management®. The whole spectrum of project and programme management is presented: From methods of project and programme management, project organisations, Project Portfolio Management until quality assurance in projects and programmes illustrated by many graphs and figures. Happy Projects is also available in Romanian, Hungarian and Chinese. Case histories from around the world provide lessons on the international application of project management. This edition contains 16 completely new chapters, including ones on the rebuilding of Iraq, project management in outsourcing initiatives, and developing multinational teams. and English project management case studies regarding the company and the family; Information about German and English literature regarding process and project management; Information about products of selected project management software companies.